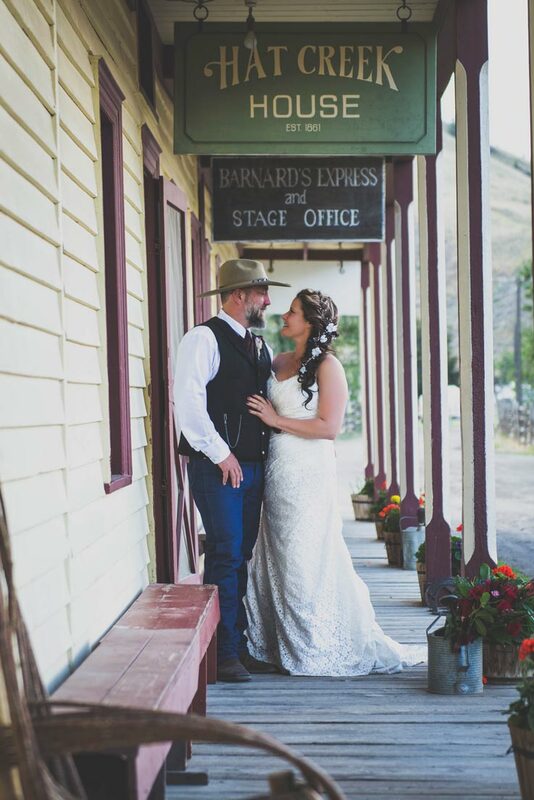 Whether you are inviting 2 guests or 200 guests, Historic Hat Creek can provide you with a beautiful country setting for your special celebration. With our central location, spacious atmosphere and abundant history, we offer a unique wedding backdrop that is sure to please! You may take your vows among the beautiful heritage apple trees. There is plenty of room for your family and friends to watch this special ceremony. After the ceremony guests are welcome to explore the site. Guided tours of the Roadhouse, McLean Cabin, Indigenous Village and stagecoach rides are available at a special wedding rate of $5.00 per guest when purchased in sets of 20 wristbands. The hay shed is located beside the rv camping area. It can be used for a sit down reception and for a dance. There is an attached Saloon (concession stand) and even a stage if you would like to hire a band! Historic Hat Creek offers endless, creative scenery for your unique outdoor photo shots. If you desire something unique that is not included in our package please don’t hesitate to inquire. We will do our best to meet your requirements. To reserve your wedding space please call or email our office to check availability and to discuss your plans. Cancellation Policy is 30 days prior to the reserved date. A 10% charge of the full booking is non-refundable. Less than 30 day cancellation is subject to full payment. We would love to discuss menu options for the wedding dinner. We have a chef on site ready to review options for your perfect meal. We have done everything from BBQ burgers to salmon dinners, to carved roast beef feasts in the past. Bring your ideas and we will do our best to accommodate your request, or let us prepare a menu for your review. As well, you may chose anyone you wish to cater your wedding, you are not obligated to use our services. Email contact@historichatcreek.com to put your dream wedding into motion! Historic Hat Creek is the perfect location for your special family event or friendly get-together. With various accommodations and RV sites to choose from, we have the space for groups up to 200 people! There are 2 extra-large lawn areas for outdoor games. The hay shed is available to rent for meals or a dance. Attached to the hay shed is a concession stand and a stage. You may move picnic tables into the hay shed, however NO vehicles are allowed to park in or drive through the structure. There are 2 campfire pits which may be used when there is not a fire ban in effect.